Let’s do this once manually to see how it works in this blog post. In the next post that follows this one, we’ll collect all these commands into a script so it can run in a single step. To start, boot the target PC from your install media. Instead of selecting region and keyboard layout, press SHIFT + F10 to open Command Prompt. Type diskpart and press Enter to start Disk Partitioning Utility. The sequence of Diskpart commands shown in this post creates this disk layout captured running the Windows Installer in a VM. In the next blog post, we’ll show how to automate this process as a script you can run during the install process. Stay tuned! One thing that I seem to have forgotten from original post: be careful with DISKPART > SELECT DISK X > CLEAN command! CLEAN will wipe the selected disk. It does not ask you to confirm the action, it simply does what's told wiping the disk empty. Even some experienced users and admins overconfidently think that first HDD (DISK 0) is always the system disk where Windows is installed, that cleaning DISK 0 will remove the old OS and make system disk completely unallocated. Just to give an example, I have one laptop that when booted from USB sees it as DISK0 and the OS HDD as DISK1. Selecting DISK 0 in this case and cleaning it wipes the USB drive, not the disk I intended to clean. Although adding a command and a few seconds to workflow, it's always a good idea to check this. Run DISKPART, then LIST DISK to see which disk is what, and first then run rest of DISKPART commands told to be sure that correct disk will be selected and cleaned. Can you explain the significance of the id - does it have to be that id, or can it be anything? 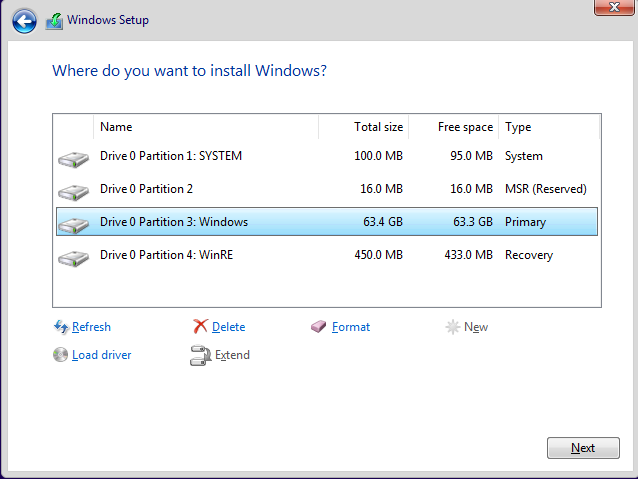 The ID is significant because it sets the partition as a "recovery" partition type. In diskpart, typing "help partition create primary" will list a set of id's and their purpose. Thank you so much Mr. KariFinn for this, to partition UEFI/GPT HDD Using Diskpart. Can I apply the same partitioning method to an external USB HDD inorder to install Windows on it?